The North-East, and Manipur in particular, have emerged as major sports hubs in the country. In the second of a three-part series peeking into the lives of three young sportswomen from the state, Shail Desai tracks archer Bombayla Devi Laishram’s meteoric rise to the top despite all odds. There’s a question that never fails to crack her up. It has everything to do with her name and the assumptions that come with it. “I’m not sure how the word spread, but no, I wasn’t born in Bombay,” giggles Bombayla Devi Laishram. “I was born in Imphal. It’s just that my father really liked the name Bombayla, so it stayed,” she adds. Archery too has stayed with her since those early days. Her mother, M Jamini Devi, was a local archery coach; Bombayla would spend hours watching her at work, and shadow her actions with a little bamboo bow. At the age of nine, she was allowed to take lessons under her mother’s watchful eye. “Do you know how hard the bowstring is? Even though the range was only 10 metres, I just couldn’t get myself to pull it back, and it took me a while to get used to the action,” she recalls about her less-than-pleasant first day. 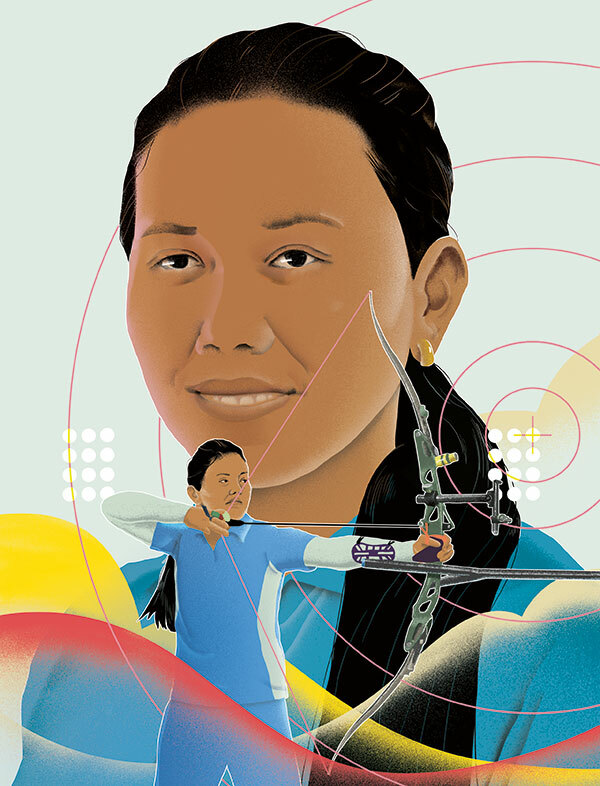 Armed with the basics of the sport at 11 years of age, Bombayla was taken to the archery ground at the Khuman Lampak stadium in Imphal by her mother. She was enrolled in a hostel at the facility, so that she could be close to the action while fine-tuning her skills. The days started early. She would train during the morning session, and follow it up with school and evening practice before hitting the sack. “I almost quit the sport because it all got very hectic. On days when I didn’t feel like training, I would go straight home from school, but my mother would promptly drop me off at the ground to ensure that I didn’t miss a single session. And I’m glad now that she did so back then,” she says. Over a period of time archery took priority over her education, and she would go to school only to appear for examinations, while spending the rest of the year competing at various tournaments around the country. In 2006, she broke into the Indian team and went to her first international competition at the 1st Asian Archery Championship in Dhaka, Bangladesh. “I was under a lot of pressure. I had never left the country before that, and I was the newest member on the team,” she says. The next year, Bombayla came back with an individual gold in the recurve event at the Asian Archery Grand Prix in Isfahan, Iran, in 2007. “It’s my favourite medal because it was my first individual gold. Even today when the chips are down, I try to visualise my state of mind during that event and it definitely helps,” she says. That success unleashed the beast in her, and she firmly established herself as a permanent member of the Indian women’s recurve team, which notched up regular wins. The first World Cup medals came in 2007 in Dover, England, where she picked up the bronze alongside more experienced teammates Dola Banerjee and Chekrovolu Swuro. Two years later, she won another bronze in Antalya and assured the Indian team’s dominance from 2010 to 2016 by winning World Cup medals in each of those years. “I think the key to success is knowing your teammates so well that you are all essentially one person. It doesn’t matter how old the other members are. I’ve been as compatible with Dola (now 38), as I have been with Deepika Kumari (now 24). What is important is to reach a frequency that everyone is comfortable with,” she says. Bombayla considers her greatest challenge to be the 2010 Commonwealth Games in New Delhi, due to the expectations of the raucous home crowd. “The initial rounds were truly testing, and the cheers brought equal amounts of pressure with them, though it got easier as we progressed. That gold was well-celebrated,” she says. The same year, the team won bronze at the Asian Games in Guangzhou, China, and followed it up with a silver medal at the World Archery Championships in Turin, Italy, in 2011. What has eluded her is an Olympic medal — another feather she wants to add to her cap in 2020. At camp, Bombayla’s routine is as physical as it is mental. Her release comes during her evening sessions in the kitchen, where she whips up local Manipuri dishes. And when competition beckons, there’s another routine that she follows with equal dedication. “Before any competition, I speak with my mother, who gives me the same pep talk, but it never gets old. I also distract myself with some television before gearing up for competition. That winning feeling is simply incredible,” she signs off. Read part 1 with Samjetsabam Sarjubala Devi here.